The number of tax slabs should be reduced to one to two over a period of time, a top Goods and Services Tax (GST) Council official said on Monday. The GST currently has 5 percent, 12 percent, 18 percent and 28 percent tax slabs. There has been debate on the multiplicity of tax slabs under GST with experts and analysts suggesting their reduction but Goyal said that currently the reduction of tax slabs under GST was not feasible because of the wide variety of goods and sevices under the tax net. Some one must be completely out of his mind to make such an outlandish statement. The plethora of compliance requirement will completely destroy the focus of SME which is manufacturing. Every month they will be doing paperwork and uploading data for the fudge masters i.e. the GOI of today. Regarding getting rid of tax terrorism, perish the thought. The purchaser's data will not match the seller's data even if there is a small mistake on either side. The notices will be issued after such a lapse of time that the parties to the supposed crime will have to dig deep into history to try to correct. By that time the penalties, late payment interest will pile up and one would feel sorry that he ever took set offs which he thought were legitimate. 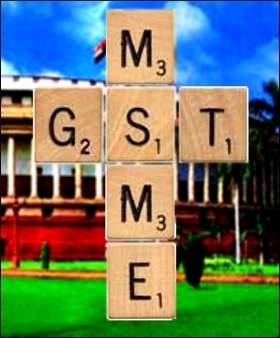 The cost of compliance will overshadow the benefits, if any, of GST. As it is small players who were exempted from Excise Duty will now by paying a small component of excise duty, making their products more expensive. The earlier Governments knew the mischief they were creating when they imposed service tax in a small way. But the present dispensation does not even know the shaky ground under their feet and cannot refrain from their regular habit of shouting from the roof tops as if everything will fall in place just by their shouting. Alternate narratives cannot become actual or real just by shouting about them. IF any Service tax changes this year? what about the service tax? GST is Integrated Tax for Goods and Services. So service Tax will fall into one of the GST slabs, mostly 18 % wherever it used to be at 15 % after subsuming Swatcha Bharat and Kisan Kalyan Cess etc. So for all practical purposes Service Tax in the new garb of GST can be assumed to be 18 %. Gst will destroy SME sector unless Exemption limit is increased to Rs 2 crores from Rs 20'lacs which is peanuts.